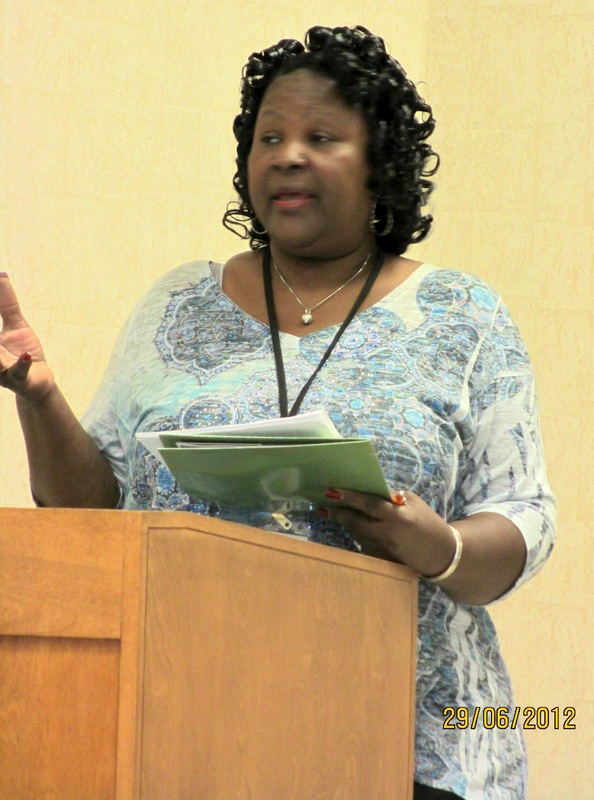 ACTION SOUTH is the online Newsletter of The New South Network of War Resisters. Look to ACTION South for the stories and photos of Southeast activists at work building a regionally sustained and locally informed movement from the ground up. As the outside temperature in Chattanooga, Tennessee held steady at 105 degrees, the conversations, networking, and presentations inside at the June 28-30 Know Nukes Ya'll Summit got even hotter. More than 100 anti-nuclear activists, primarily from the Southeast, gathered at the University Center of UTC for 2-1/2 days of informed discussions, work, play, talk, music, listening, and learning about Nuclear Power, Weapons, and Waste in the South. 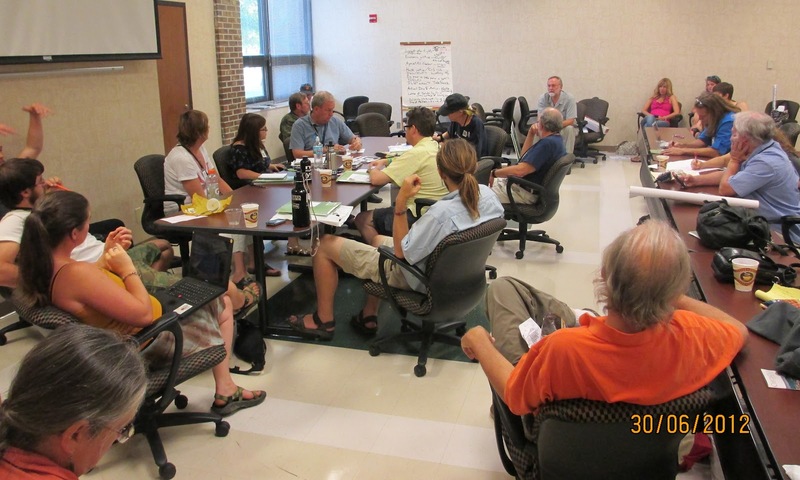 Organized and sponsored by a wide variety of groups and individuals from grassroots citizen actionistas to national networks, the summit also drew participants from Oregon, Wisconsin, Michigan, and Iowa. 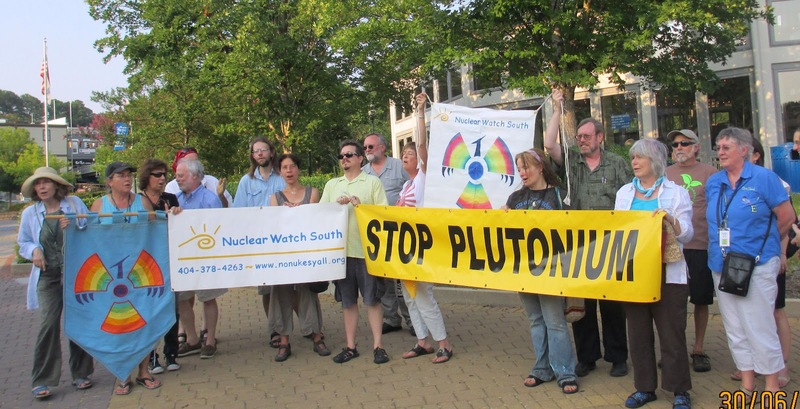 Dave Matos, a Colombia, SC based organizer with Carolina Peace Resource Center has written a great report of the weekend on the website Nuclear Free Planet. He called the gathering "at once a family reunion, a networking opportunity, a working meeting and an intensive seminar." We agree! Joanne Steele, guitarist & Tree of Peace storyteller, is an Alabama activist and board member of Nuclear Watch South. She added her music to call us together in song. Rita Harris, longtime organizer with Sierra Club Memphis' Environmental Justice program, along with Bobbie Paul of Georgia Women's Action for New Directions (WAND),and the Rev. Charles Utley of the Blue Ridge Environmental Defense League chapter in Richmond County, Ga., focused on the Cancer clusters found in the African-American community in Shell Bluff, GA near the Vogtle Nuclear Plant during the Environmental Justice discussion group. They were joined by Dr. Yomi Noibi, Director of Atlanta's Environmental Community Action Inc. (ECO-Action). Highlighting the weekend were action oriented and movement-building sessions such as the Vogtle Action Working Group, pictured here planning a swarm of activities to educate and focus public attention on the issues and conduct Nonviolent Direct Actions at the plant. The Vogtle Nuclear Power Plant in Shell Bluff, Georgia, has received billions in government guaranteed loans (pronounced public subsidy) to bolster the so-called nuclear renaissance. This facility is seen by many in post Fukushima Japan, including Hiroshima survivor Shoji Kihara, as the most important U.S.nuclear project to halt and turn back nuclear development in Japan. This could redirect precious resources to safer, cleaner, and more economical energy sources. Despite the deadly serious subjects discussed, a spirit of collaborative action and mutual support prevailed throughout the conference, bridging the usual communications gap between industry, academic and organizational professionals and volunteer grassroots organizers. The Tennessee delegation was strong. The activists we met from the Volunteer state have no intention of allowing the government to continue to poison Tennessee. With its nuclear waste "landfill loophole" that has enabled 6,700 tons of radioactive waste to be dumped annually into municipal landfills, along with its growing nuclear weapons and power industries, Tennessee has increasingly become an international radioactive sacrifice zone. Bellefonte Efficiency & Sustainability Team (BEST), and Mothers Against Tennessee River Radiation, both BREDL Chapters, are taking on the Tennessee Valley Authority (TVA) nuclear power program. Others in Tennessee are hard at work too, educating and activating the people. Ralph Hutchinson of Oak Ridge Environmental Peace Alliance presented on the long history of resistance at the Y-12 bomb plant, and Linda Modica spoke about the uranium dangers from DU weapons manufacture in Jonesborough and nuclear fuel processing in Erwin, Tenn.
Don Safer, Chair of the Tennessee Environmental Council, along with Sandy Kurtz, founder of the Tennessee Environmental Education Assn. 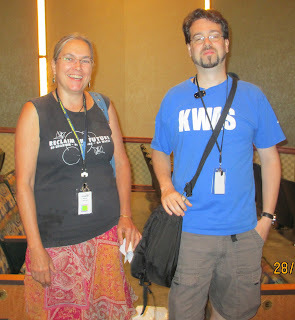 were two of the more visible Tennessee folks that kept the conference on track and moving forward. Dave Freeman the former TVA board chairman who convinced the TVA board to mothball plans for eight reactors shortly after the 1979 Three Mile Island partial meltdown, called nuclear power "the worst failure in our history." Thanks is due to all who had a hand in organizing, promoting and supporting this crucial Southern summit. Nuclear Information and Resource Service staff Mary Olson and Diane D'Arrigo provided detailed information and played key support roles along with Glenn Carroll of Nuclear Watch South. Many, many others had large and small parts to play. 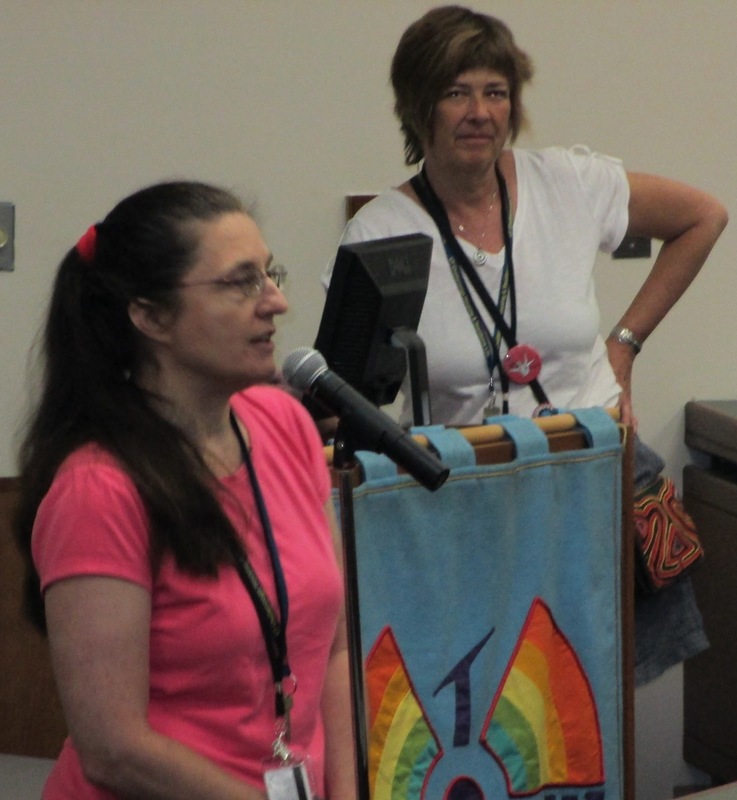 New South Network of War Resisters' presentation, Atomic Appalachia & the S.E. Nuclear Complex: Weapons and Power--A Deadly Alliance" was well-received. Look for us on the road throughout the region. Bring us to your event by contacting us by email or call 828.301.6683. We appreciate your feedback. Let us hear from you.